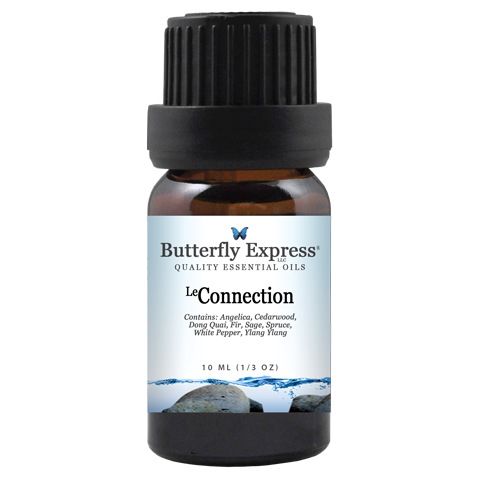 LeConnection has a delightful aroma which is centering, grounding, and emotionally balancing. This is a good oil to diffuse or wear when life has become too crazy and overwhelming. Although this blend is very much in the emotional realm, it has proven helpful for menstrual cramps and for lowering high blood pressure. LePurify kills odors, bacteria, molds, and fungus. This is an excellent oil for cleaning any portion of your home. Because it is mucolytic (dissolves mucous), cedarwood is useful for chest infections, asthma, and coughs. It it also soothing and healing to the skin, and especially, to the scalp. Cedarwood is often used for dandruff, hair loss, and psoriasis. Sage's ability to strengthen the pelvic chakras, and organs within it, gives vigor and strength to the vital centers of the body. With nerves, lymph, and pelvic organs being strengthened, it is easy to see why sage has long been considered the "master healer". Yarrow is one of the truly great healing oils! Applied topically to a cut, even deep ones, yarrow will pull the edges together and help the cut to heal. Yarrow's antiseptic properties are also strong enough to prevent infection. AROMATIC CONSIDERATIONS: The aroma of violet on first impression is very green-grassy and leafy all at once. Applied to the body or diffused, it develops a delightful floral overtone. The aroma is soothing and inspiring. EMOTIONAL / SPIRITUAL / MENTAL ASPECTS: Violet supports the heart and the emotions that reside there. Violet is particularly balancing to feelings of melancholy, nostalgia, and longing for things past. Violet can also be used effectively to temper obsessive tendencies. The aroma of violet leaf can help us focus mentally, pay attention more easily, and see clearly to the core of confusing issues in our lives. The clarifying influence of violet leaf essential oil can help us realize our potential and overcome feelings of fear. PHYSICAL ASPECTS: Inhaled, particularly using a cool mist humidifier, violet can relieve migraine headaches and clear blocked nasal passages. Violet leaf can be applied topically to relieve the pain associated with sprains, bruises, and arthritis. Violet leaf essential oil, applied with water rather than a carrier oil, can cleanse and close the pores of the skin and increase lymphatic drainage. Violet is considered a liver decongestant and circulatory stimulant. Violet oil should be applied to the chest or inhaled when there is a need to bring up phlegm (expectorate). Check out the new Spring Resilience Kit from Butterfly Express! This kit has great oils to help build your immune system and get you ready for spring. It also includes LeDeliverance and Hand Sanitizer to help keep your environment germ free. GENERAL INFORMATION: LeDeliverance can be used, diluted, or diffused, in the home as a cleaner and air purifier to fight viruses and airborne bacteria. PHYSICAL ASPECTS: LeSeasons is amazing for clearing out the sinuses and for relieving a sinus headache. This blend should be used for colds, allergies, sinus congestion, and sinus headaches. AROMATIC CONSIDERATIONS: This blend has herbal tones that remind you of walking in the woods which is very grounding to all systems of the body. This is a good oil to bring you back to happy summer days spent among nature's greenery. EMOTIONAL - SPIRITUAL - MENTAL ASPECTS: LeWoodland Path is designed to allow us to take a journey down a woodland path, to get a touch of spring, to reconnect with our wonderful Mother Earth. Use to relieve stress, center yourself, and begin anew as each spring the woods do. "Our children may outgrow our lap, but they will never outgrow our hearts." Yarrow is a circulatory tonic, focusing its strength on the integrity of veins and arteries. When given hot as a tea, or in quantity, Yarrow will raise the heat of the body, stimulate circulation, and produce perspiration. Besides having so many healing properties and affecting so many body systems, Yarrow has some other unique characteristics that set it apart. For example, Yarrow contains all of the usual vitamins and minerals found in plants that are used medicinally, but it also contains vitamin F. Vitamin F is an essential fatty acid that is necessary for the good health and integrity of all of the membranes throughout the body, including those which surround the brain and within the brain itself. The vitamin F also contributes to the unique way that Yarrow acts as an astringent on each body system individually. Yarrow contracts and tightens membranes, making the retention of gallstones or kidney stones impossible, and Yarrow is good for any condition in which too much secretion (whether mucus, blood, or pus) is a problem. Yarrow also stimulates the production of bile, making it a digestive/gallbladder tonic. Zinc is second only to iron as the most prevalent trace mineral in the body. Zinc plays a role in cell division and growth, wound healing, the breakdown of carbohydrates and is needed for good immune function. Coconut is another popular carrier oil. Like almond oil, coconut is inexpensive, absorbs quickly, has almost no aroma at all and has the added advantage of a long shelf life at room temperature without rancidity. For those of you who like a little bit of chemistry information—this liquid form of coconut oil has had the smaller fatty acids and the long-chain triglycerides removed. Without these ingredients there is a very, very slow rate of oxidation. This is a carrier oil that does not go rancid, even in the summer months! Other advantages of fractionated coconut oil include: odorless and colorless; absorbs readily into the skin, leaving not residue; does not stain clothing and easily washes out of clothing and bedding; although absorbing very quickly, liquid coconut oil is an excellent skin moisturizer; rarely aggravates existing skin problems such as fungal or bacterial infections; does not clog pores. Fractionated coconut oil leaves the skin feeling smooth but not greasy. I believe that fractionated coconut is one of the best carrier oil products available. I love it and the solid coconut variety! The common misconception: anxiety needs medication... let's say instead, constant supervision! The line between anxiety disorders and everyday stress can be unclear. You might want to know where your stress comes from, but everyone experiences anxiety from day to day. It may be you have a predisposition for it. Maybe you had a bad experience as a child or an adult. Whether you have a diagnosed anxiety disorder or are not sleeping because you are going to have a big day tomorrow, there are some ways to help yourself relax. In either case, be aware of the warning signs that collectively say your worries and fears are out of control. Some signs of anxiety are muscle tension, constipation, diarrhea, panic attacks, depression, and headaches. Worrying usually makes it harder to function and carry out everyday tasks. Anxiety makes us worry more, and problem solve less. It is full of drama, musing, and procrastination. The enemy of anxiety is action. Often, anxiety catches us off guard. We fabricate many what-if situations based on things we can't see, then we analyze and worry and think about it until we are mentally and physically exhausted. There seems to be no solution, nor will there ever be. This is an endless cycle of pointless analytical thinking. We are rarely in danger, or crazy, so let's not waste our time trying to fix something that's not true. If we are panicking it is because our thoughts are fearful, irrational, and exaggerated. Those of you that suffer from anxiety know of what I speak, so how do we overcome the anxiety that won't go away? Instead of ignoring your anxiety or pushing it away, acknowledge it! Own it. You can't fix a problem you don't have. Once you recognize that you are panicking or worrying irrationally, then you can calm yourself down with counteractive thoughts. You are not dying, your feet are on the ground, and those you love are safe. Don't use unhealthy words like hate, always, never, stupid, dumb, ugly, flawed, unlovable, etc. The cognitive triangle teaches that thoughts affect feelings and behavior. When we follow the advice of Tinkerbell and find our happy thoughts, we will be able to fly and not be stuck in the mud. Logically, positive thoughts construct positive feelings. If you see a dog and think, "Oh, what a nice dog!" You will feel happy and pet the dog. If you see a dog and think, "That dog will bite me!" You will be afraid and run away. A healthy mind promotes a healthy body. Don't let your mind wander down dark paths. Don't entertain all the fearful scenarios that might happen or the what-ifs that don't even exist. Learning to recognize and counteract a doomsday mindset will help you stay away from unnecessary worry. As always, drink more water, make sleep a priority (7-9 hours for an adult) and breathe! Make a plan to be happy and practice it every day! Emotional health is a skill and does not come easy. Like practicing the piano, you will not excel unless you use the muscles and remind them every day. Everything in our lives is a result of our decisions. You may choose to live with your situation, or you may change it. If you have struggled with anxiety for a long time, this may be difficult, but taking an active role in your thought process can make it possible to rewrite your constant mind chatter and the feelings that follow. Like I said in the beginning, anxiety needs constant supervision. If it goes unchecked for a day, like a child, you never know what can happen! So live in the moment, with a smile, and take action. Your happiness awaits!